I was led to believe that the stones of granite along the banks of the shore west of town up to the Donkey Bridge were from the castle, can anyone confirm this..there are some beautiful stone there. No Brian don't think so, these are polished stone; maybe the Museum would know where these large stones came from..I am assuming of course that they are still there.. The version I got was that it was some of the spoil from the Inchindown oil bunker but that wouldn't have been granite would it ?? As far as I can acertain the Castle was built of yellow sandstone. Could be right there, Tommy but the picture above gives wrong dates..the Castle was destroyed in 1872 and replaced with a mansion which in turn was demolished in 1928, so perhaps the stone came from the mansion..do you know if the stone is still there along the road towards the donkey bridge? Hi Harry, looked at stone today and is most definitely not from the castle. Over the years I have come across a lot of stones from this once fine building including some of the stonework from above the windows and almost all the ballustrade around the main tower and can confirm that it was in fact built of yellow sandstone. I understood the castle/mansion was destroyed by fire. Is this why it was demolished in 1928? 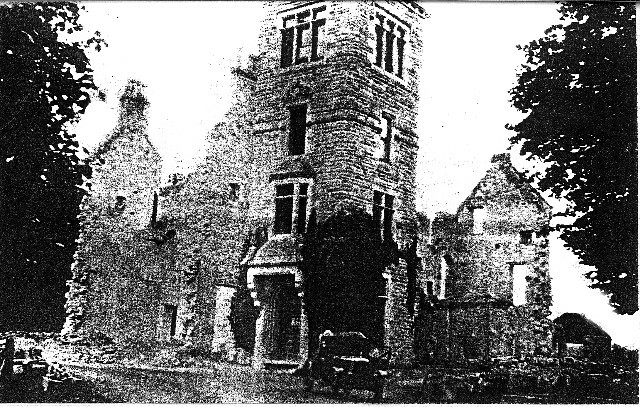 This may help: About the time of the First World War, Sir William Martineau bought Invergordon Castle and Estate from the late Captain Roderick MacLeod. Rumour had it that Sir William did not want to see another big house when he looked out of his windows at Kincraig. The Castle was demolished in 1928. After the castle at Invergordon was demolished, Sir William built the present House of Rosskeen for his son Roderick, who changed his name back to MacKenzie by deed poll. Sadly, Roderick died before his father, and Sir William then made the estate over to his grandson, Mr Robin MacKenzie. As Sir William died shortly afterwards, there were double death duties to pay so part of the estate was sold and eventually Kincraig House was sold too. Regarding the stone on the beach. As far as I can recall, the sea defences from the Donkey Bridge in to the grassed area at the bottom of the High Street consisted of rough hewn quarried granite. This was covered over in the 70s with bricks from the masonry surrounding the tanks and miscellaneous rubble which may well have included the Railway cottages, also with deck sections of an arm of the centre pier, and with red granite from a short lived quarry on the Struie. The granite blocks extended from Shore Road from a point where the old coal yard was, to around the Donkey Bridge. I remember them as being there all the time, so they were there in the forties. In the 40s and 50s the castle or mansion was occupied by a Lady Anderson, so am wondering where she fits in the scheme of things...does anyone recall this occupant? I guess it is possible that the granite chunks along the shoreway must have been rough hewn and brought in from Rubislaw or somewhere nearby in Aberdeenshire. I can't understand what their purpose was as the Firth is not particularly at threat from erosion or tidal damage?